Avocado-VT is our test suite, but for simplicity purposes it can only run on a single host. For multi host tests, you’ll need the full autotest + Avocado-VT package, and the procedure is more complex. We’ll try to keep this procedure as objective as possible. You have at least 2 virt capable machines that have shared storage setup in [insert specific path]. Let’s call them host1.foo.com and host2.foo.com. You can ssh into both of those machines without a password (which means there is an SSH key setup with the account you’re going to use to run the tests) as root. Note: The bootstrap procedure described below will be performed automatically upon running the autoserv command that triggers the test. The problem is that then you will not be able to see the config files and modify filters prior to actually running the test. Therefore this documentation will instruct you to run the steps below manually. 16:11:20 INFO | Recommended command qemu-img missing. You may want to install it if not building from source. 16:11:20 INFO | Recommended command qemu-io missing. You may want to install it if not building from source. Now, you’ll see a boatload of output from the autotest remote output. This is normal, and you should be patient until all the tests are done. # Almost synchronized migration, waiting to end it. # Work is started only on first VM. # Migration started in different threads. # It allows to start multiple migrations simultaneously. # Starts one migration without synchronization with work. # Starts another test simultaneously. # Wait for mig2 finish. VM’s disks will be prepared. The synchronization server will be started. All hosts will be synchronized after VM create disks. It prepare VM if machine is not started. Check work on VM after migration. Wait for finish migration on all hosts. It’s important to note that the migrations are made using the tcp protocol, since the others don’t support multi host migration. This example migrates only the first machine defined in migration. 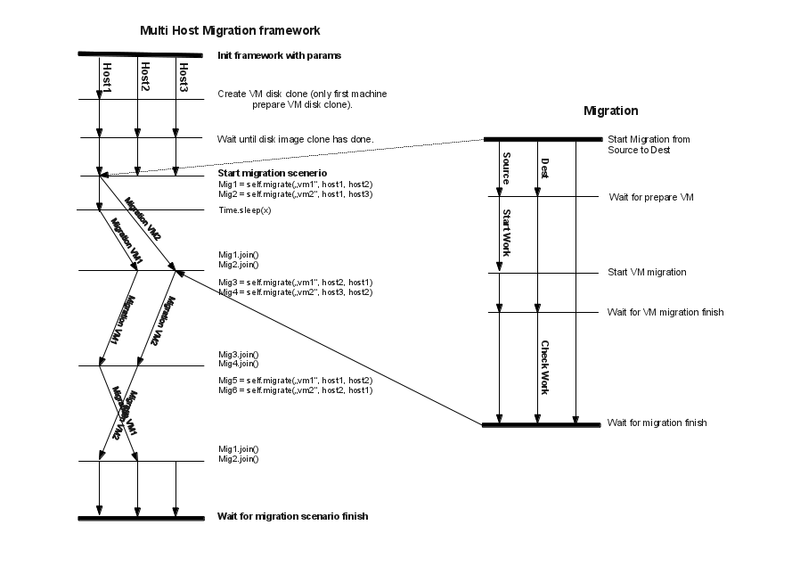 Better example is in virt_utils.MultihostMigration.migrate_vms_src. This function migrates all machines defined for migration.